Discussion in 'Expert Advisor atau Robot Forex' started by yonif, 28 Apr 2018. Yes you are right, Yonif the results you are showing are from real or demo account ? Yonif your leverage ? 1:30 ? Very good results these 2 weeks in live trading, V4. tickmill. what's your leverage sir ? Yonif do you think breeze can run safe with 1:30 leverage but with low capital such as 200$ ? 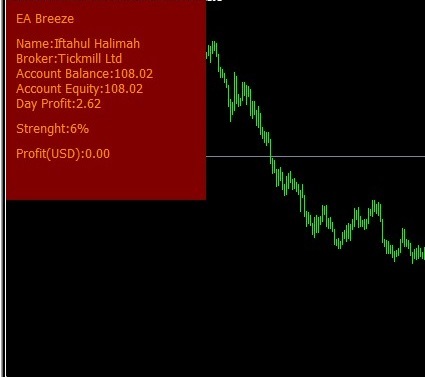 EA Breeze adalah salah satu EA trading dengan tehnik scalper yang juga merupakan pengembangan dari EA Trend Reversal final.. Jadi EA ini sangat cocok bagi para trader pro maupun pemula yang mempunyai ketertarikan besar dengan tehnik scalping. 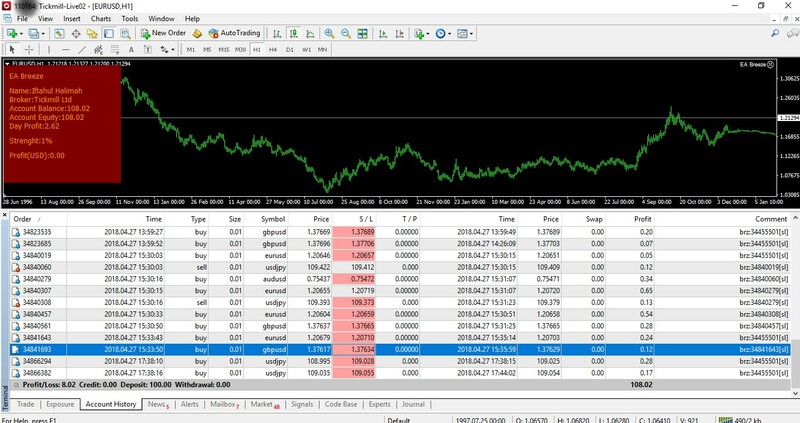 Dalam trading forex, scalping merupakan strategi forex di mana sang trader mencoba untuk “memungut” profit kecil secara beruntun. Seorang trader akan masuk dan keluar dari pasar beberapa kali dalam sehari, mencoba untuk mencari keuntungan di antara pergerakan pasar yang volatile. para trader yang demikian ini biasa disebut scalper. EA breeze akan open posisi apabila strenght/kekuatan pergerakan harga melebihi 100% dari acuannya, Sehingga apabila market dalam keadaan seperti itu maka EA ini akan bekerja. 1. Broker dengan Spread rendah. Usahakan Spread dibawah 1.5 pip (15 point). 2. Broker dgn zero StopLevel atau setidaknya dibawah 5 point. 3, Broker yang memperbolehkan Scalping tanpa syarat waktu. 4. Broker dengan slippage rendah. 7. Pasang di VPS dengan ping latency yang kecil (SocialVps sangat direkomendasikan) dan akan lebih baik lagi dengan RAM yang besar. Jadi jika dilihat dari performa hasil BT dan FT LIVE account nya, EA ini bisa dikatakan sangat bagus, baik dari segi profitnya maupun drawdawnnya. please, can you tell me which "History Report" on the screenshot you use? Looks good. Hello, I think it can work very well because it does not open positions all the time. You can try it in a live demo a few days. Hi, if I'll put the EA in all pairs of setfiles I need to change the Magic numbers for each chart (ex. EU magic numbers 1-2 (default), GU magic numbers 3-4, and so on)? Why you don't put the option in one chart run all pairs which you wanted why you open it again again another by one by one why you waste time I recently make an ea which I run only one chart and select any pairs multiple pairs in one graph at any time frames. i have multi pairs correlation EA, just attach in one pairs but that can trade in other pairs also,.. like EA FTL correlation,.. so, i dont want to create EA that i has created before,.. different system,..
hhahaa,. i know sir,..put in eurusd but can trade in gbpusd, usdjpy etc right?? but if i make this EA using multi chart like that, this EA can not be Backtest,.. you know,.. sure i can do that, i have correlation EA that you just put in 1 pairs like eurusd but it can open in eurjpy and usdjpy too,.. that is possible,.. but, once again, it can not be backtest,..
and also some people do not like trade in many pairs sir,.. so, how you handle if the people just want trade on eurusd only,.. or people want to trade just on gbpusd only??? that make sense right,... also, if the people want to make different setting in each pairs how do you do to handle that???? 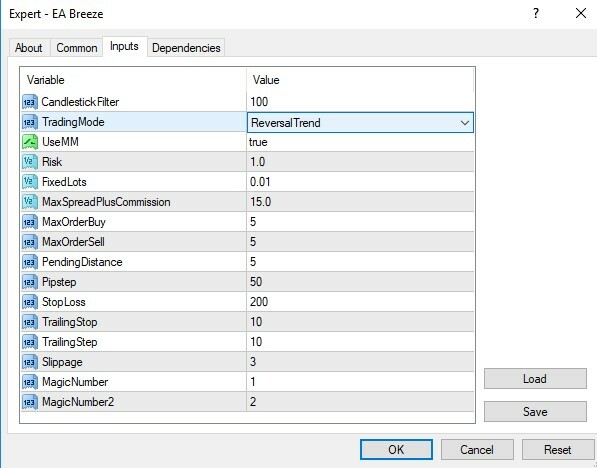 we all know the characteristic each pairs is different,..
so, if you want to create ea scalper like your describe it, that is good,.. thats cools,.. you can create an thread and share it in this forum sir,..
not all pairs can be using for scalper,.. just pairs with low spread, low slippage, high volatility..